Anyone who watches the Tonight Show knows that Kevin Eubanks (right) is into bodybuilding. 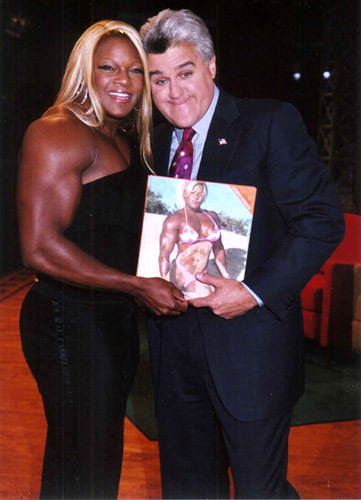 But Jay Leno is too...the female bodybuilders. At least he seems glad to see them on the set. In the past he has been photographed with Nikki Fuller (pictured on the cover of the first Bill Dobbins photo book, "The Women." Recently, he took time after a show taping to spend a few moments with Tatianna Butler, cover model of the newly published "Modern Amazons." Jay seems not to have had any trouble snuggling up "close and personal" to Tatianna for a photo. 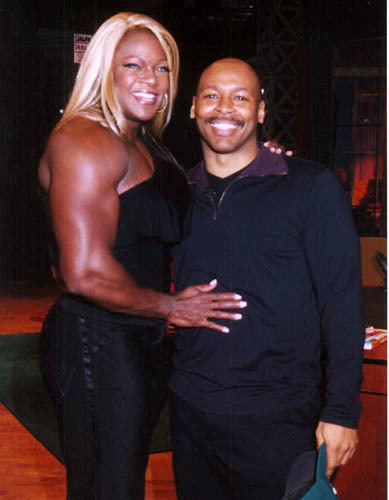 Maybe one of these days we'll see Ms. Olympia invited to appear with Jay and Kevin on the program.